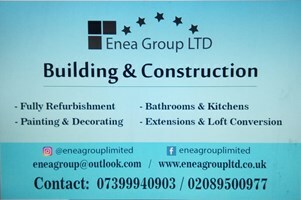 Enea Group Ltd - Builder based in Bushey, Hertfordshire. Our service aims to always be at the centre of our customers’ needs; being reliable, courteous and ensuring that there is minimal disturbance. Contact Enea Group Ltd for a free, no obligation quotation. Hertfordshire, Bushey, Watford, Mill Hill, Barnet, Edgware, Harrow, Northwood, Pinner, Ruislip, Stanmore, Wembley etc.